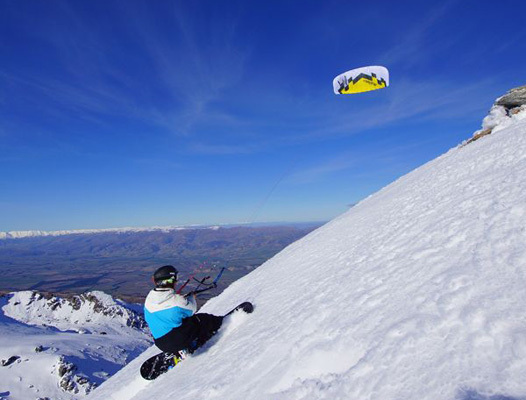 The Ozone Access Snow Kite is the Ultimate Snow Kite for a beginner. It has earned a reputation for being a true performer. This high level of performance is what makes it very popular for intermediate level flyers as well. The Access’s durability and power are very impressive for a snow kite at this price range. The Ozone Access has very steady and stable flying characteristics, until you crank that bar and take off. The smooth constant power allows you to always feel comfortable. One of the most impressive features of the Ozone Access snow kite is the internal blow out valve system which allows air to escape quickly in the event of a crash. This allows you to spend more time snow kiting and less time getting torn cells stitched up at the repair shop. The Ozone’s Contact-Snow Control Bar System has a huge de-power range which beginners will appreciate and the dual Ronstan Orbit pulley system gives very responsive handling. New for the Contact-Snow bar is the option of two safety systems. One is the Ozone “Megatron Quick Release” and the other is the “Brake Handle System”. The Ozone’s Access has been and will always be a winner in the Ozone line up of snow kites. Pick one up today and experience the freedom of not needing a lift ticket for the slopes again.